The sign for the multi-occupant gender-neutral bathroom at the Reeves Center in DC. Image by DC Department of General Services. Bathroom access might be the most visible battle right now in the wide-ranging fight for transgender civil rights, but the issue is more complex than many people realize. Gender-neutral bathrooms are the most inclusive option and bring real health benefits to real people, but in most of our region, they aren’t yet required. DC, like about half of the populated areas of the United States, protects the right of individuals to use any bathroom that corresponds with their gender identity. So does Maryland. Virginia neither protects that right nor denies it, leaving the decision to business owners. But what if the individual is neither a man nor a woman, and no bathroom corresponds with their identity? This idea, that there are people with non-binary gender, might be a new one to some readers. There are lots of websites that explain non-binary gender, and it’s worth clicking through a few of them in depth. Non-binary people are those like me who, regardless of their biology or clothing, are neither men nor women. Many use ‘they’ as a singular pronoun, rather than ‘he’ or ‘she.’ In DC and several states they can have ‘X’ instead of ‘M’ or ‘F’ on their driver’s license, and in DC, Arlington, and Alexandria, that will soon be an option in schools. Some argue that non-binary people should simply be allowed to choose which gendered bathroom they want to use. That’s the status quo, and is a pragmatic solution. But it’s a little like suggesting that DC residents, who are denied the right to vote for congressional representation, should just be allowed to choose between voting in Maryland or in Virginia—it doesn’t respect the identity of the third option. Gender-segregated bathrooms, though omnipresent today, are a thoroughly modern invention. Less than 300 years have passed since the first gendered bathrooms appeared in Paris in 1739. In the US, the practice wasn’t enshrined in law until the ‘separate spheres’ sexism of the late 1800s. Bathroom segregation is an unusual trend in our recent history, not a universal common-sense approach. That unusual trend may be on its way out. Universities across the country, like American University locally, have opened gender-inclusive bathrooms. These are both single- and multi-occupancy, the latter with locking private stalls. Why are gender-neutral bathrooms so important anyway? Transgender people benefit from inclusive restrooms as much as non-binary people do. They might not feel comfortable or safe in a gendered bathroom, even if their right to use it is legally protected. In 2009, three years after DC elected to protect that right, 68% of transgender survey respondents were “denied access to, verbally harassed in, and/or physically assaulted in public bathrooms.” More than half reported resulting injuries to their physical (especially urinary) health, which has been echoed in other studies. In 2018, an employee at Cuba Libre in DC demanded identification from a transgender woman who was trying to go to the bathroom. In 2016, some transgender people, including youth, were misgendered and harassed at Banneker Pool in DC when trying to go to the bathroom. (In 2017, people were misgendered again at the Trans Pool Party event at the same pool, including the police sergeant who's DC's LGBTQ liaison.) Right now, a transgender English teacher in Prince George's County is suing after says she was repeatedly harassed and threatened by students, parents, and colleagues at three schools. Sadly, the list of such incidents goes on, but all this is to say: gender-inclusive bathrooms help make gender-nonconforming people feel more safe in public spaces. That's why they're popular among the transgender activist community. Gender-inclusive bathrooms benefit gender-conforming people, too. They're safer for families with children, as parents will be able to accompany other-gender children to wash up without fear. Young unaccompanied children have in fact been violently attacked in bathrooms, though not by trans people. Claims of trans people bringing violence to bathrooms have been debunked by multiple studies—rather, transgender and non binary people are also vulnerable to being attacked there. Beyond safety, gender-neutral bathrooms are also helpful for people with disabilities who have other-gender caregivers. Lines tend to be shorter, and because the stalls are generally more sealed without wide gaps between the frame and the door, they offer greater privacy. It’s also cheaper to construct a single gender-neutral bathroom than two smaller segregated facilities. Maxine Andres, a transgender woman on the board of the Arlington Gay and Lesbian Alliance, says “I’d make them all gender-neutral and take the urinals out. That would solve the entire problem instantaneously.” She continued that the process should be gradual, not requiring businesses to change their bathrooms right away, but only as part of bringing the building up to code during larger renovations. “I don’t think it would be fair to inflict costs,” she explained. In 2006, DC passed a law, the country’s first, requiring that all single-occupancy bathrooms must be labeled as gender-neutral. Jurisdictions in Virginia are unable to enact such policy because of the state-level Dillon Rule that withholds all powers not explicitly granted by the state legislature. There are a lot of ways to indicate an inclusive bathroom. Here's one example of an all-gender restroom sign. Image by Like_the_Grand_Canyon licensed under Creative Commons. In 2017, the Reeves Center became home to DC’s only government-run multi-occupancy gender-inclusive bathroom. Sheila Alexander-Reid, director of the Mayor’s Office of LGBTQ Affairs, commented that the DC Government is hoping to bring similar facilities to other public buildings after that success. Even in DC, finding a place to go can be hard for a gender-non-binary person. Many restaurants, cafés, bars, and workplaces have only multi-occupancy bathrooms. DC law doesn’t apply on federal land, which houses the city’s most-frequented tourist attractions. A spokesperson for the Smithsonian Institution confirmed that all visitor bathrooms in all museums are multi-occupancy and gendered, but while there’s no space to add new ones, some conversions might be possible. 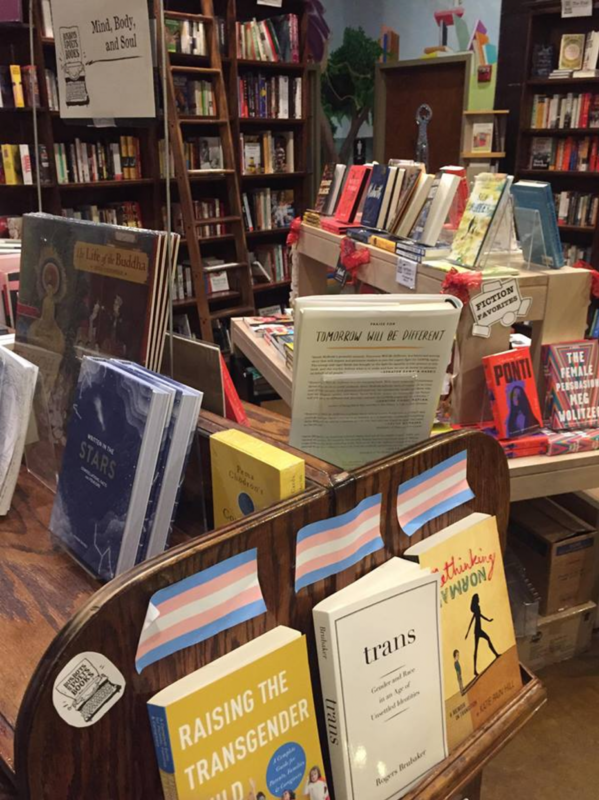 The 14th and V location of Busboys and Poets, where with no apparent sense of irony a single-gender bathroom stands behind a shelf of transgender literature and where the sole non-gendered bathroom is employees-only. Busboys and Poets did not respond to a request for comment. Image by the author. What can you to do make bathrooms more inclusive? Ultimately, any shift toward gender-neutral bathrooms will be driven by individuals like you. Anyone, transgender or not, can play an important role in making our city more gender-inclusive. So, what can you do? First, you can help identify illegal single-occupancy gendered bathrooms in DC. Under the Safe Bathrooms DC campaign, you can report noncompliant bathrooms by Twitter (#safebathroomsDC), phone (202-481-3773, say you want to submit a bathroom complaint) or online. The business in question will be politely but firmly required to put up inclusive signs. You can speak to the manager of your workplace and ask that they install a gender-neutral bathroom, particularly if they're planning other renovations soon. You can point out that this change would comply with Occupational Safety and Health Administration (OSHA) best practices. Make it a habit to make the same request at cafés, bars, or restaurants that you visit. Your comments will help steer the conversation. Finally, as an engaged citizen in your own jurisdiction, you can push for more inclusive laws and facilities. In Virginia, where local policies are limited, you can push for inclusive facilities in public buildings. For those who live or work in Arlington, County Board member Katie Cristol encourages you to be involved: “interested community members… can write the County Board at countyboard@arlingtonva.us and may also wish to attend meetings of the Public Facilities Review Committee, a citizen-led body that provides input on the design of new public facilities.” Fairfax County has a Citizen Advisory Committee for school buildings and hosts hearings for all proposed public buildings, also accepting comments electronically. Maryland jurisdictions are capable of enacting DC-like bathroom policies, but have not. You can encourage them to do so by contacting your representatives on the Montgomery County or Prince George’s County councils.